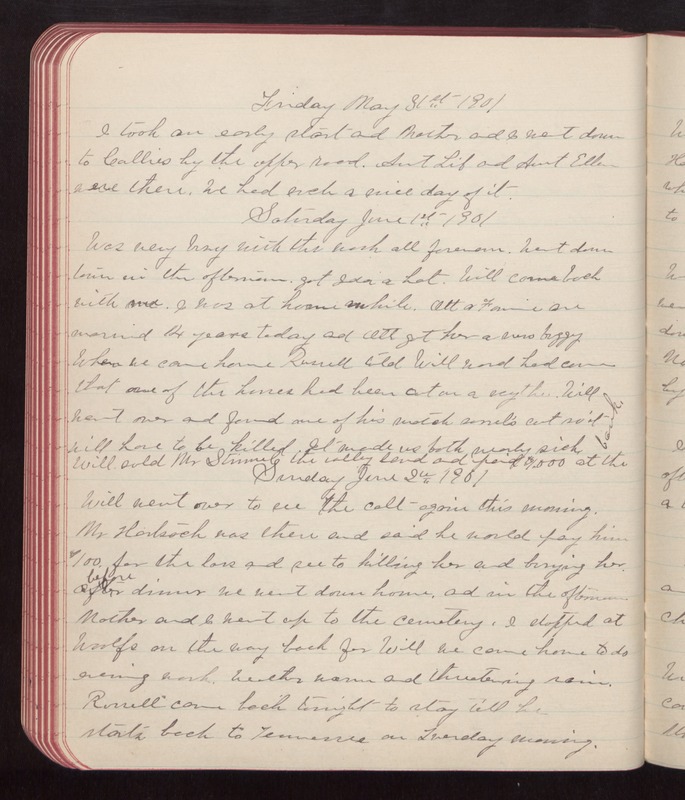 Friday May 31st 1901 I took an early start and Mother and I went down to Callies by the upper road. Aunt Lib and Aunt Ellen were there. We had such a nice day of it. Saturday June 1st 1901 Was very busy with the work all forenoon. Went down town in the afternoon. got Ida a hat. Will came back with me. I was at home awhile. Ott & Fannie are married 14 years today and Ott got her a new buggy When we came home Russell told Will word had come that one of the horses had been cut on a scythe. Will went over and found one of his match sorrel's cut so it will have to be killed. It made us both nearly sick. Will sold Mr Strimel the valley land and paid $1,000 at the bank. Sunday June 2nd1901 Will went over to see the colt again this morning. Mr Hartsock was there and said he would pay him $100. for the loss and see to killing her and burying her. before dinner we went down home. and in the afternoon Mother and I went up to the cemetery. I stopped at Woolfs on the way back for Will we came home to do evening work. Weather warm and threatening rain. Russell came back tonight to stay till he starts back to Tennessee on Tuesday morning.